Phone wiring isnt just for phones anymore. Ordinary telephone wiring cant handle todays rapidly expanding communications needs. Faster and more reliable than ordinary phone wiring, low-cost, high-tech copper wiring (Category 5 or better) should serve every room in the modern home. Its what is needed to carry voice, data and other services from where they enter the house to every room, and from any one room to any other. This guide gives the basics on wiring your homes for the rapidly evolving information age-and todays homebuyers demand it. If you dont offer this service, rest assured, your competitors will. Right now, the typical home doesnt require the capacity to move computer signals around as fast as the typical office. However, offices get extensively remodeled-and rewired-every few years. Homes do not. The wiring you put in your homes must serve indefinitely. Todays educated homebuyers-and homebuilders too-realize its better to use the most advanced wiring technology up front, when installation is economical. Retrofitting each room of a house at a later date can be done. But it's better to anticipate the homeowners future needs by wiring the house with a state-of-the-art system while its being built, and at the same time provide yourself with a powerful marketing tool. The phone wiring of the past, often referred to as quad wiring because it has four copper wires, is now obsolete. Cat 5 or higher speed wiring has four twisted wire pairs, or eight wires. All are needed to provide the multiple services discussed here. In fact, an FCC ruling, effective in July 2000, now requires that homes, as well as businesses, be wired for the information age. Copper UTP wiring contains eight color-coded conductors (four twisted pairs of copper wires). It offers greatly increased bandwidth compared with old-fashioned quad wiring. The cable is small (roughly 3/16 inch in diameter), inexpensive and easy to pull, although it must be handled with care. Several phone numbers can be made available throughout the house. Actually, voice service requires very little bandwidth, and the addition of separate numbers is almost trivial. Cat 5 has an approved bandwidth of 100 MHz (megahertz), while Category 6, when finally approved as a standard, will likely accommodate at least 200 MHz when tested under stringent conditions. Bandwidth correlates with speed, and these bandwidths are many orders of magnitude greater than the bandwidth required for a "modern" 56 kbps (kilobits per second) modem. Category 6 wiring, with encoding, will be able to carry at least 1 gigabit (billion bits) per second. If youre counting, thats about 50,000 pages of text per second. The Internet is now available at high speed to many homes, but homebuyers wont be able to take full advantage of it if their wiring is inadequate. One high-capacity technology now being offered by local phone companies is DSL (digital subscriber line). And cable modems are being offered by cable TV companies that bring in the Internet on the same coaxial cable carrying the TV signals. Will these signals reach a dead end in your new homes? Will the information highway end in a cow path? Interference on telecommunications lines can result in scrambled faxes, interrupted on-line sessions and distorted video and audio signals. High-tech twisted-pair copper wiring is designed to resist interference from sources in the home, such as microwave ovens, vacuum cleaners, fluorescent lights, power tools, other appliances and external communications signals. The tight, accurate twist of the wire pairs and their balanced mode of transmission are the reasons. Performance of these cables is verified by Underwriters Laboratories (UL), the international product testing agency, and similar groups. Most of the reasons have been mentioned: ability to move large quantities of data around the house; ability to move a limited number of TV signals from the point of entrance to anywhere and everywhere else in the house (using a readily available adapter); ability to move other signal-level entertainment to as many locations as desired; and of course phone, fax and computer/printer connections wherever desired. Since the builder can only guess at the future uses of the various rooms of a house when he builds it, its best to provide outlets virtually everywhere. For instance, the kitchen is often the business center of a household and thus needs multiple jacks. quality of signal- each additional connection point is a potential source of interference and other problems which can cause a loss of signal quality. Having an extra outlet or two in some rooms, particularly home offices, is a wise marketing move, since you cant anticipate future room use or furniture arrangements. This should be accomplished with home runs to the additional outlets. Most seasoned professionals strongly recommend running extra wire to any location where it might be needed later. For example, two 4-pair cables might be run to each outlet, rather than one, to enable expansion and flexibility. Figure 1 (below) is a simplified plan of a small, two-bedroom, single-story house. Note that all the wiring radiates from a single distribution devicethe star patternand there are multiple outlets in each major room, including the kitchen and the porch. 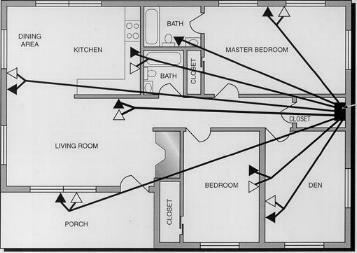 Figure 2 (below) is a larger, two-story house, with a den that could well serve as a home office, again showing the star wiring pattern. These devices provide connection points for all eight of the wires contained in the four twisted pairs. 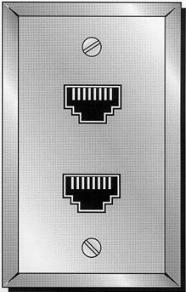 Figure 3 (below) shows a wall outlet with two such jacks. how long a cable run can be (about 300 feet). More details on installation practices will soon be available in a separate CDA publication. All connecting devicescentral distribution device, plugs on the ends of cables, outlets, etc.-should be rated for the cable used. For instance, if Cat 5 cable is used, all devices must be at least Cat 5 rated. If Category 5E or 6 cable is used, all devices should be similarly rated. Finally, the finished installation should be thoroughly tested. Although the industry is working toward an all-UTP solution for wiring residences, at this time it is prudent to also include conventional coaxial cable for video distribution, particularly cable TV. This is because it is difficult to predict whether many channelswell over 100, for example-may become a reality in the near future, some channels of which will be the more bandwidth-consuming high-definition television (HDTV). If coax is installed, quad-shielded RG-6 coax, with an all-copper center conductor, should be used for superior performance. (Copper-plated steel center conductors are also available, providing additional stiffness, but are unable to handle low-frequency currents used to power some devices.) A lesser grade, RG-59, should not be used. Now is the time to start differentiating your homes from those of your competitors by wiring them for the Information Age. High level UTP wiring to every room is a clear sales advantage at minimum cost to the homeowner. 1. In the telecommunications and electronics industries standards are important. However, because of the fast moving nature of these industries the marketplace usually runs well ahead of the standards-setting process. Cables meeting the expected performance standards of both Category 5E and 6 are commercially available from multiple vendors at this printing. The standard for Cat 5E is now official, but for Cat 6 it is still pending. Use the best cable available.